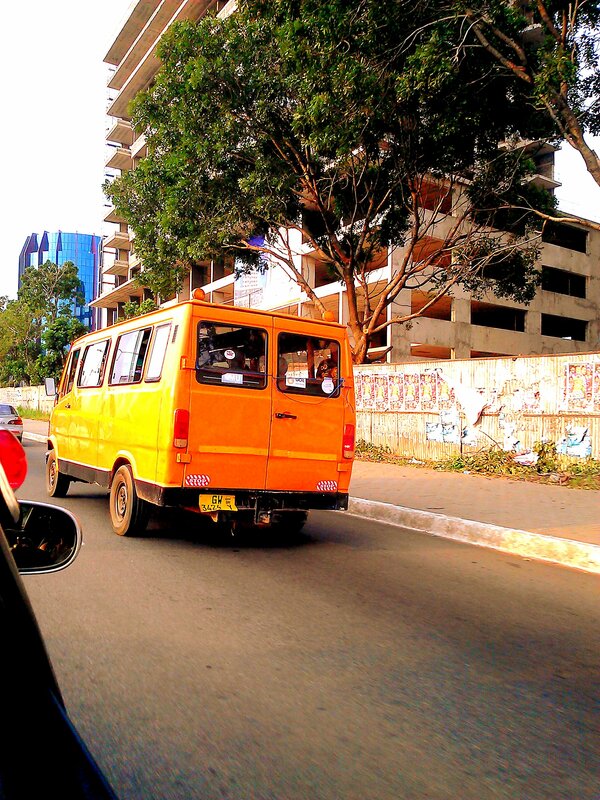 A “Tro-Tro”-a form of public transportation in Accra. Ghana…I had never heard so much about a country before visiting it. Various people had given me their own perspectives about their visits to Ghana. They all had come to one conclusion: that it was life-changing, whether for good or bad. In July, I got my first taste of Ghana. I traveled on my birthday, 11th of July, from Cleveland to New York and New York to Accra, non-stop. I had learnt to leave my mind open, to not expect too much or too little, as that was the easiest window to frustration and disappointment. So on the plane, my mind was blank, and since good old Delta Airlines didn’t have individual TVs so I could watch a movie, I spent time sleeping and chatting to a College of Wooster Alumna across from my seat, and a Ghanaian student studying at University of Alabama beside me. I decided to glean some information about Ghana from my fellow passengers, and the information I got from them is summarized as: a fastly growing economy, but with rife corruption. Corruption? I smirked, because as far as I knew, no one could beat my Sweet Sierra Leone when it came to that. So I brushed that aside, and decided to become excited about the positive aspects of Ghana. I had arrived for the MILEAD Fellowship at The University of Ghana in Legon,a fellowship for Women’s leadership in Africa wherein amongst 2,000 applicants, only 28 young women had been chosen from all over Africa for a year-long fellowship.an integral part of this fellowship required us to convene in Ghana for 3 weeks, and to Ghana we all went. Of course life is boring without the juice of drama, so my luggage had to be lost for close to five days. Another passenger had taken it instead of his, and me, with preconceptions of luggage theft at airports (Sierra Leone to be specific),I panicked like nobody’s business. I had to go the airport every single of those five days to ask the airport authorities at Lost and Found how far the investigation had gone. As far as I was concerned, they were guilty of theft, as Delta officials had reassured me that my luggage had indeed arrived at Kotoka international Airport. As it turned out, another passenger had indeed taken my suitcase instead of his own as they looked very similar and he had to travel all the way from the northern part of Ghana to give me back my suitcase. At last, I was relieved, all the gifts I had brought for my family were intact, no one had stolen my suitcase. You can imagine my trauma those five days, but through it all, the Ghanaian airport authorities were extremely helpful, genteel and somewhat vigilant, actually exceeding my expectations. The Delta official at the Lost and Found kept on calling me, to check up with the details of the case, and continued calling to update me till I got hold of my suitcase. Needless to say, I was baffled by their willing ness to help without me solely running after them like a headless chicken, confused and confounded. And that, in a weird way, was my first taste of Ghanaian friendliness. I have a fear of stereotyping and putting people into general categories, as that takes away individual agencies and belittles the unique qualities and experiences of people. So I am going to try to apply my personal policy of non-generalization n this piece. I will focus why I have come to consider Ghana as my second home with particular focus on Accra, since it is unfair to speak about my experience in Accra as a Ghanaian experience, having only been in Accra for a mere three weeks. One of the first things that struck me were the Ghanaian characteristics in Accra, mild-mannered, genteel, friendly and above all ,extremely proud of their country. Of course not everyone I met fit into that box and there were people I encountered that made me wonder if the krio phrase “na di wan black man” was no longer just figurative, because of their similarities to some Sierra Leone characteristics. The luggage saga was stressful, but there were Ghanaians who were more than willing to help out, the Lost and Found airport authorities in particular. Now, don’t get me wrong, it was not all smooth and rosy. However, considering the circumstances of being a foreigner and not really knowing anyone in Ghana, and the assumption of West-African lethargy and bureaucracy which I had, I was not prepared for the ease of the willingness to help from them. Ghanaians also had a unique sense of national pride, with the flag of Ghana rising high over many houses and painted all over some buildings. There was a general sense of oneness despite the different ethnic groups. Maybe it was because I was in Accra, or the fact that I was only there for three weeks, or I might not be that well-informed, but I didn’t get a sense of tribal tension or stratified ethnic differences. The Ghanaian culture was so very rich and diverse (Ghanaian culture here meaning a sum of all the different cultures I encountered).Banku and Tilapia was a general delicacy and I couldn’t point out which ethnic group that delicious meal was attributed to .All the Ghanaian songs I boogied to at Firefly, Shaka Zulu, and The Republica (to name a few), had a certain beat that was so distinct and profoundly Ghanaian. Zoom into Osu, Oxford street, and the rows and rows of stalls selling bags, jewelry, purses and slippers decorated with Kente or colorful traditional cotton cloth, were endless and somewhat overwhelming. And of course, how can I forget the infrastructural development. A visit to the World Bank building in Accra left me wondering whether it was the headquarters for just Ghana or West Africa in general. Yes, Accra as a city, compared to many others in West Africa (cough cough: Freetown), has gone far ahead. I am a proud Sierra Leonean, so proud of my country that I am one of the first to get very defensive and angry when people attack my country or have certain negative misconceptions of it. Despite this pride that I have, I am also extremely critical of my country ;infact I like to say that I am in a love hate relationship with Sierra Leone. But such a relationship is important, because I am able to critically examine what is wrong, objectively. Having had the chance of always leaving Sierra Leone and being able to go back and look at it from an outsiders lens has made me realize how far ,oh goodness, far behind we still are as a nation. And that is not to say that there has been no improvement; things are indeed turning around for the better, my issues with Sierra Leone’s development have to do with both the pace of it and the mentality of her citizens. I wrote this piece not as an ode to Ghana or Ghanaians, but to push my fellow Sierra Leoneans to realize that just three countries away, is a nation that has risen above desperate economic struggles, to make itself a model of development and democracy in West Africa, and we can do the same, if not better. We have to better our sense of national pride, stop individualistic or tribalistic traits of “I” or “we” (in this sense meaning an ethnic group), and learn to look at the larger picture. It is only when we better our sense of national pride and have a sense of the national “we” that we will become extremely embarrassed when ranked as the world’s most corrupt nation, and not laugh about it and point fingers. Sierra Leone’s growth rate was 12% in 2012,but the poverty situation is still extremely desperate. I can go on and on about Sierra Leone’s problems, but that is all Sierra Leoneans ever talk about-what is wrong, and when it comes to how to solve the problems, the blame game opens. No one wants to accept individual responsibility for the decay of our country. A sense of national pride and “we”ness, if there is such a word, has never been this urgent. National pride brings about a sense of shame , that is not just general but even personal, when we are accused of being this corrupt, this poor. It is this sense of national pride that has led me to spew this kind of unapologetic comparison to Ghana, a country where I had gone to with the assumption that my luggage had been stolen by the airport authorities and a Ghanaian told me, with pride bursting from his chest “we don’t do that here!”. Can I say the same for my country? It has indeed gotten much better, but that is still yet to be proven. There are Sierra Leoneans who are doing whatever they can to better their nation, whether in the diaspora or at home-I salute them, let us continue to strive towards a common goal of bettering Sierra Leone, and not our individual or immediate selves.